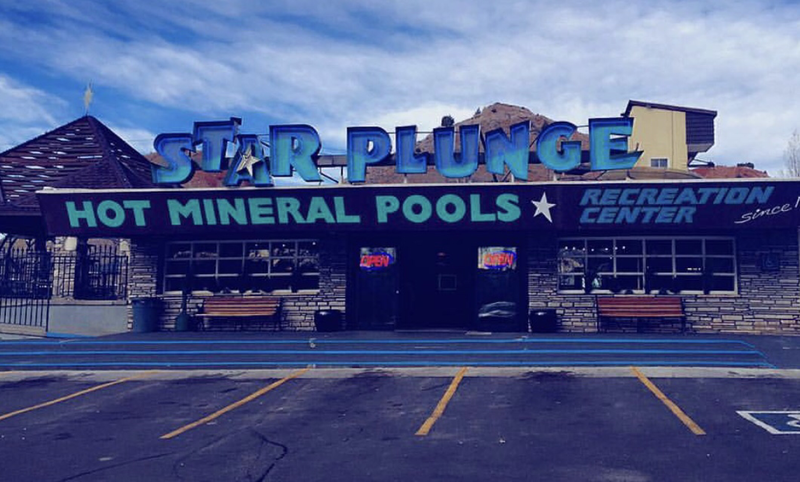 General Description: Star Plunge Hot Springs​ ​is family hot springs playground located in the heart of Hot Springs State Park in hot spring capital of Wyoming in a town called Thermopolis. Star Plunge Hot Springs boasts is a world-famous hot mineral pools. Star Plunge features 2 large hot springs pools, 3 hot spring waterslides, 2 hot spring tubs, a vapor Cave, 2 hot spring baby pools, 10′ High Dive, Game Room, Snack Bar, and Gift Shop. Day use only. Clothing is not optional. Location: ​From Themopolis, Montana is 1 1/2 mile or 5 minutes to drive to the hot springs. ​Located in the Hot Springs State Park, Wyoming. Accessibility: Star Plunge Hot Springs​ is very accessible. You can drive up to the Plunge It is an easy walk around the park. Star Plunge is handicap accessible. Hot Springs: ​Star Plunge Hot Springs has an indoor and outdoor pool that is heated by hot water from the Big Spring. The inside hot springs pool is 94-98° degrees. The outdoor hot springs pool is 90-94 degrees. The hot spring hot pool with water and air jets is 104° degrees. Star Plunge features three hot springs waterslides. The “Super Star 500” is one of the world’s longest water slides, gushing over 2,400 gallons per minute down a flume that measures over 500 feet. It is open Memorial Day through Labor Day. The “Blue Thunder Run” is a 330 foot all weather hydro-tube that curves around a 60 foot tower. The “Lil’ Dipper” is a 60 foot warm mineral slide just right for the little tots. This park also boasts a unique hot springs vapor cave to let off some steam. Star Plunge does not use chemicals. Hot Spring Tips: ​Star Plunge Hot Springs is day use only. The hot springs are all natural. No chemicals are used in their water. This park is not pet friendly. Bring the kids this is a family destination. They have tanning beds. Star Plunge offers season passes. Youtube Video on Star Plunge Hot Springs is below.